With our once monthly fish box arriving on our doorstep yesterday we decided to make the most of it and eat it while its really fresh. We had a wonderful haul of cod, plaice fillets, scallops, dover sole, lemon sole and sprats. We coated the sprats in a light batter made of plain flour, salt and a little of the fabulous Nyetimber (extravagant yes but it was bubbly and open). They were then shallow fried in oil over a high heat. Ideally they would have been deep fried but rapeseed oil is quite expensive and we didn’t want to go mad. They were very good although I will admit that they are not my favourite to eat but were a good starter to our fishy supper. Next I moved my attentions to main course. 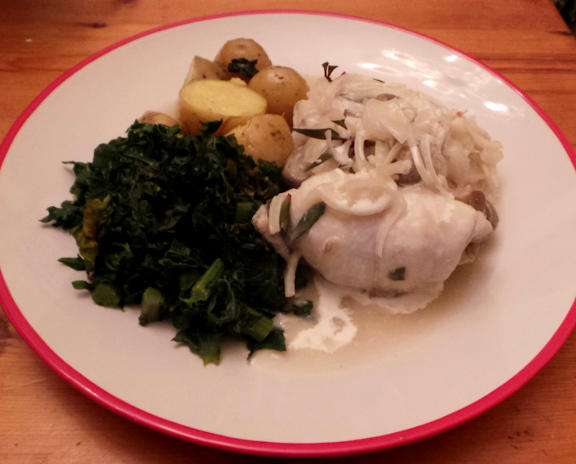 Lemon sole with a creamy mushroom sauce. I would totally recommend this as a special treat. 1. Roll the scallops inside the fillets of sole head to tail and arrange in an oven proof dish. 2. Pour over the wine, water, onion, mushroom stalks, herbs and seasoning. 3. Bake, covered at 170°C with a buttered paper or foil or lid, for 20 – 30 minutes. 4. Strain the liquid from the fish and make up to 300 ml (1/2 pt) with extra water or wine if necessary. 5. Poach the mushroom caps in this liquid for a few-minutes — remove and keep warm. 6. Make a roux with the butter and flour and make up a sauce with the fish liquid. 7. Add the cream to the sauce just before serving, pour it over the warmed fish, and serve with the mushroom caps.